I am named after my great Aunt Regina Roggow. She died in 1906 when she was only 5 years old. She shares a grave with her little brother Erwin who was only three. They died of Scarlett Fever. If you are parent, you might have gotten those little slips of paper that warn of an instance of strep throat in the classroom. After getting the note you probably watched your child more closely and perhaps made a trip to your local doctor to pick up some antibiotics. My great grandparents did not pick up antibiotics; there were none to be had, instead they picked out a headstone. When I was a child, I would visit this small grave on the wind swept prairie of Oklahoma. I would grasp plastic grave flowers in my pudgy fist. I would step carefully through stickers and cockleburs that would catch upon my ankle socks. I would walk towards the back of the cemetery to the children’s section. I want you to think about that. The children’s section. So many children died back then they had their own space. Here the tombstones were smaller and often depicted lambs. I would kneel at Regina’s grave and press the flower deep into the red dirt. I would cry for a child I had never met. 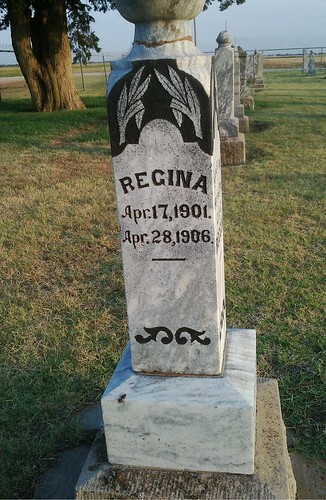 When began I visiting Regina’s grave she had already been dead for over 70 years. It was hard to read her name on the weathered granite. I would trace the indentations with my little finger. The years passed. I grew and Regina’s name faded. Recently my Aunt Minnie asked the folks at Pellow Monument Works in Enid Oklahoma if they could do anything to improve the text on the grave monument. Aunt Minnie wanted the visitors to be able read the stone. The Pellow team said they could. The painted it with black lithochrome and then re-sanded the granite to its original tone. Now its message is crisp and clear. Regina has monument on the prairie in Oklahoma. Now due to this post, she will have one online as well. When I speak, I speak for children like Regina and I speak for men like my late husband Fred Holliday. I, like many who work within patient advocacy, want to make sure our loved ones did not die in vain. We want the world to remember them, and through telling their stories effect great and positive change. Sometimes due to our personal sorrow or anger our messages are not clear or can be off-putting. Sometimes due to inexperience we will say things that are considered rude within the world of social media. I am writing this post to address the etiquette and protocol within social media as it applies to advocates and the communities to which they post. Advocating from sixth stage of grief. You probably know about the five stages of grief: denial, anger, bargaining, depression and acceptance. A good friend of mine named Trisha Torrey wrote about the sixth stage of grief calling it Proactive Survivorship. Proactive survivors have gone through the five stages of grief and want to help others. They still remember their sorrow and anger, but they do not let these emotions control their advocacy or cloud their message. They have replaced blame with hope and their story is not tragedy; it is triumph. These advocates are often the most effective. Some advocates are still actively experiencing anger and depression. It is hard for them to hear the joy and success of their counterparts. Often these two groups will be at odds with each other. Please take a deep breath when you post to other members of the social media community. We all have experienced suffering; we all have a reason for being here. We may just be at different stages of the journey. The smiley face is your friend. In tweets or in facebook comments there is not a lot of time for nuance. If you say something quickly and think it can be taken in a negative way the simple emoticon J can do much to eliminate ruffled feathers. Don’t spam your friends. When you have a new link or post that you are excited about do not cut and paste it repeatedly in every forum or group. Sometimes the post is of extreme importance with a limited window of action ie; public comment period is almost over, tweetchat is tonight or a reporter is looking for content relevant to a dead lining story. We will understand a deluge then. Rather than over-posting, posting it where it is most appropriate, then tailoring your message to the group will help with spread. If you become known as an advocate that spams multiple groups with the same post, your messages may become synonymous to white noise and disregarded. Everything in Moderation. Do not attack a advocate personally for their thoughts on a subject. We are all working toward a common cause of improving the patient experience. Try to be civil in your debate. If you are concerned about comments directed to you in a public forum, contact the poster privately if possible. If that is not possible, contact the moderator or admin. They can remove inappropriate comments. Know that certain types of comments can result in an advocate being blocked from a site. It is important that list serves and facebook groups be safe places where people feel comfortable speaking truthfully and with respect. Group membership will decline if the space feels like the Wild West. I have seen too many groups loose valuable membership because of poor self-moderation of comments. Twitter is a caused based platform. In twitter we use hastags: #hcsm (healthcare social media) or #ptsafety(patient safety) to follow concepts or chat sessions. This is usually done in a very public way and most accounts are open. The stream of comments can be searched through google and those who tweet should know that their writing could be seen by anyone. On twitter you can follow people who do not follow you back. You can comment to them directly by posting in the public stream. If you wish to say something privately you can send them a direct message if they can follow you back. Direct messages are like short private emails between two people. Facebook is a wonderful tool for finding people. This platform is more closed. I have never been able to find a facebook comment during a google search, though I can find the person and their interests. In facebook, you can communicate by including a friend’s name within your post and it will appear publically on your wall as well as their own. This is a good tool if you know this person well and know the message is very much inline with their life and mission. If you think it might not reflect their worldview it is not considered appropriate to post it on their wall. If you wish to say something privately a facebook message is used. A message can be between two or more individuals but is not a public form of communication. Copying the text contained in a message and sharing it without permission is considered a breach of trust. Please always ask permission before sharing private messages with other people. Your blog is your voice. The blog is an amazing tool. Here your can explain your stance in patient advocacy in great detail. Unlike a website, it is rarely static and very easy to update. You can post links to your blog on both twitter and facebook. A lot of misunderstanding occurs online when you do not have the space to explain yourself in full. A blog can give you the time and space to be clear and if you enable comments you will get questions directly. Enabling comments will also help you to understand the hard job of moderating comments, a challenge that facebook administrators are well aware of. Empathy is a good and valid teacher. Writing in all capitols in twitter or Facebook is perceived as screaming or yelling in this space. If you served in the military you may have written in all caps for clarity, but online this can be very off-putting. It often reflects badly upon the person who posts in such a way. There are many who will not read what you have to say when you do this, so do it rarely, choosing a word or two for special emphasis. It may be called SoMe, but it is really about us! In social media it is crucial to listen and share. Talking and posting is important, but this relationship works because of give and take. It can be very off-putting to other advocates if we post constantly about our own cause without focusing on and sharing the content of other speakers in this space. It is very important to network our messages with other advocates, providers and thought leaders. Look at the places you comment. If you are constantly redirecting everyone to your own site and campaign, you are monopolizing the conversation. You are creating a monument to those you loved. Remember all that you say in the world of Social Media reflects back on you. It reflects back on your loved ones as well. There are often times I wish to “blow a gasket” in this space. And as you well know, I have, but this too with moderation. Do not become a flamer, for flames breed fire and fire consumes all. When I die, I would like my body to be donated to science or burned. I do not want a gravestone. If my family or friends wish to visit a grave they should visit little Regina Roggow’s grave. She died too soon and I hope in some small way I have lived for her. The only monument I will ever need is already being inscribed. It is crowd sourced and is the product of social media. 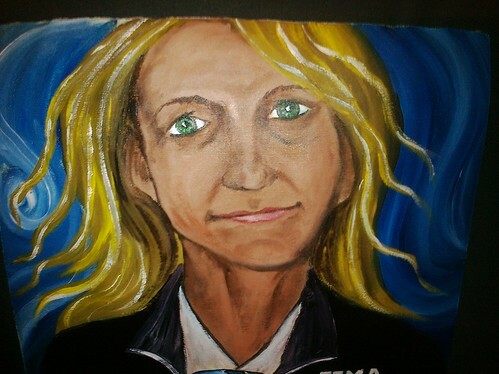 You can find it in the google search field by typing Regina Holliday artist. Remember when you post online you too are building your monument or marker in this mortal coil, do so honestly and with dignity. These were just a few thoughts upon this subject. I am a big believer in crowd sourcing so please feel free to comment in the comment field to further expound upon protocol in patient advocate social media. Several times I have braved the sticky DC heat to trudge up the street towards the headquarters to Health and Human Services (HHS). Currently there is a great deal of construction in the area. Street grit and dust assail those who arrive by the metro tunnel. It is very bright at street level and everywhere I looked stark concrete reflected the summer sun. I walked up the street to the Herbert H. Humphrey building that houses HHS. It was designed in the brutalism style. The building is a white box with a repeated series of box like windows. The grounds surrounding the building are white granite and concrete. There is nothing of nature, no tree, no grass: all is hard angular lines. I walked through the doors and passed through security. The interior of the building is a classic space with warmer friendly colors. Here the dark wood counters and floors of polished granite welcome the weary health enthusiast. Beyond security is the Great Hall. This large open space was designed for change and the seating is modular. High above large portraits of the former secretaries of HHS loom larger than life. 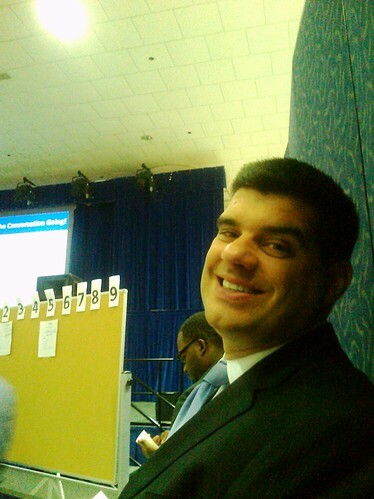 I came to HHS this day because John O’Brien, Senior Advisor of the CMS Innovation Center had emailed me an invitation to attend a National Stakeholder Briefing on Health Insurance Marketplace/Exchanges. I took a deep breath and prepared myself for the next 2 and ½ hours of what I would assume would be a lecture about the Affordable Care Act. I should have realized that this would not be a traditional meeting when I was handed a CMS packet containing only three sheets of paper. Let me repeat that: Three sheets of paper. That is quite odd. I took my seat and then began to read my packet and practically squealed in excitement! Written under a CMS logo were words I knew very well! 1. Whoever is there is the right group. 2. When it starts is when it starts. 3. Whatever happens is all that could have happened. If you find yourself in a situation where you are not contributing or learning, move to a place where you can. THIS WAS AN AMAZING DAY! CMS WAS HAVING AN UNCONFERNCE! I could not believe my lucky stars. The facilitator began explaining this process was an open space technique and they would be using it to discuss messaging around insurance exchanges. He then asked the crowd of two hundred if any of those in attendance had experienced this process before. I raised my hand proudly as did about ten other audience members. He then asked for a volunteer to pitch their idea for a session and place it on the board. There was quiet for a few seconds and then I jumped up and went to the front to grab the microphone. I then grabbed a marker and created the sign for my session. 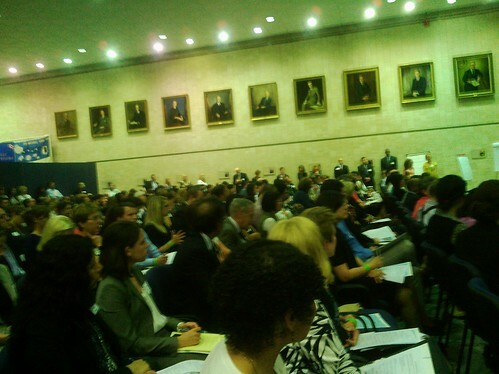 People began to stand up in the crowd and slowly come forward to propose sessions and in about ten minutes the board filled. Then we began to rearrange the chairs in the room in order to create session space. I went over to my session space to wait for our group. Four people showed up. I know full well the rules of an unconference: “Whoever is there is the right group.” I quite enjoyed the conversation in our small group. The next session I attended was about the role of the Church in helping folks understand insurance exchanges and there were about 20 people in the group. So in case you ever wondered at CMS talking about Art is scarier than talking about GOD. The session on religion was great and was facilitated Lisa M. Carr, Associate Director of Faith-Based and Neighborhood Partnerships. We had a wonderful group full of diverse perspectives. Some people worked for CMS, some in advocacy and we even had a Reverend in the group. We talked about Men’s Ministries, the importance of messaging from the Pastor and the different neighborhood groups that can be reached by one Church body. All too soon it was time to place our chairs in a circle and report out. A few people stood and expressed their excitement using this new method. I spoke out too saying how happy I would be to tell patient advocates that CMS used this disruptive form. Before I left, I gave John a big hug and thanked him for inviting me. HHS maybe shaped like a big brutal box, but the people who work there are thinking outside of it. When I was a young teen I went with my little sister Esther to get my ears pierced at Claire’s Boutique in the local Mall. If you are not familiar with Claire’s Boutique it is a shop filled with hair accessories and very affordable earrings. I remember the young shop girl who pierced our ears. She held up a tool that looked like a pliers. She explained that she would be placing “studs” in our ears. These earrings were gold plated and would be locked in place for the next six weeks. We would need to clean our ears regularly. After six weeks our ears should heal and then we would be able to wear other earrings they carried. She followed up saying sometimes certain clients did not respond well to metal in their ears. Those clients would need to stop wearing earrings or use gold earrings only. After telling us all these things she stapled our ears. My ears swelled and bled. The next six weeks were very painful. My ears were warm to the touch. I was one of those clients who could only wear gold. Gold earrings are quite expensive, so over the years I would try to wear the fashionable earring labeled “surgical steel.” Within minutes my ears when begin to swell and bleed. I thought about this experience in the years I have been a medical advocate I have spoken to a great number of patients who have had medical devices implanted in their bodies. A few of them have suffered a great deal. They complain of a deep tissue itch, swelling and pain. I asked them if any of their doctors explained potential allergic reaction as well as the shop girl did at Claire’s Boutique. They all said no. There had been no warning, no discussion. Now they suffer with little recourse. There is an patient champion who has made advocacy in this field her life’s work. Joleen Chambers blogs under the title FIDA: Failed Implant Devices Alliance. She became part of the patient advocacy community after spending years speaking for her brother as he suffered in anguish due to a failed implanted elbow. He was placed on a long term maximum dose of pain medication. Joleen began speaking out as she became aware of all of the patients who were suffering with failed implants who could not find surgeons to repair the damage done. 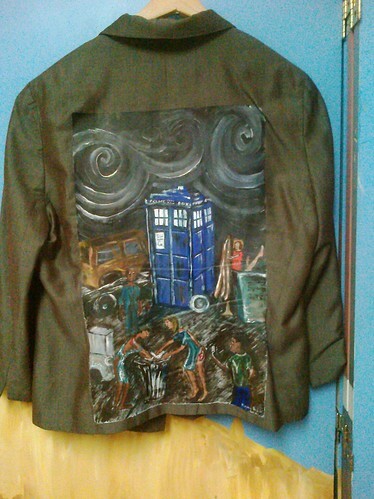 This jacket is framed by a scene from Doctor Who: a brilliant British science fiction television program that her family enjoys as much as mine. This image is based on the first scene in the first episode of the program. This is a scene in a junk yard. 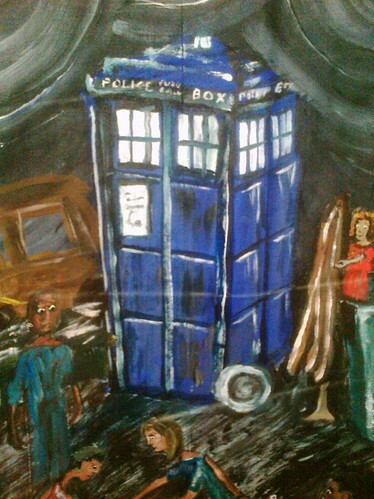 The classic blue police box is surrounded by so much junk and perhaps is considered junk itself. In of the darkness, patients seem to be scrounging through the bins and piles of derelict parts. If you look closely at these patients you will see large wounds at the joints of their body. Metal hip joints and shoulder joints are in bins. The patients paw through the open bins in the hope that they can find a part that will replace the broken a failed part inside of them. I thought this a perfect image for Joleen. 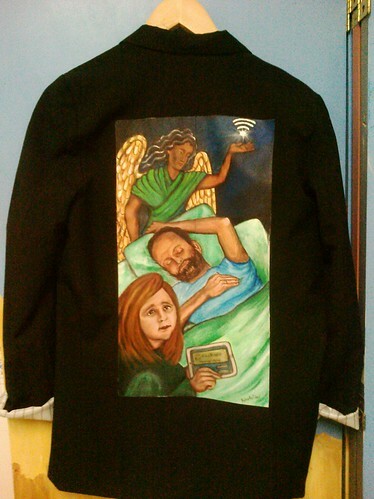 I am sure there are many who look at this jacket and do not think it a serious image, just as many people don’t take failed implantable devices seriously. Joleen has a hard long battle a head of her. Recently she submitted an essay to Mayo Clinic for Social Media Scholarship Essay Contest. She is asking all of us to like her essay or tweet it so she can be a finalist in the competition. I urge you to do so. She works very hard in field shrouded in darkness much like the scene of her jacket story. 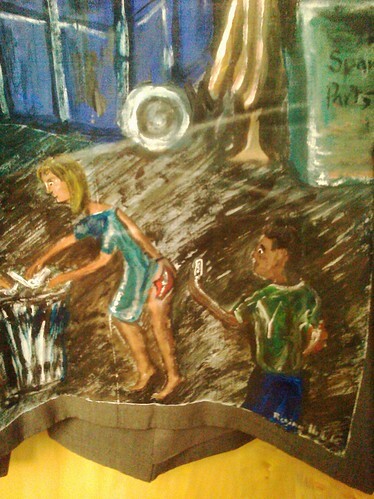 There is very light in this painting, but light is comes from a smart phone and a person willing to tweet injustice. Once upon a time a poor man entered a village and asked if the villagers had any food to spare. The villagers said no. It had been a hard winter and each family was hoarding what little they had. The village was small and the man was strange so though they would not help him, they began to watch him. Perhaps he would leave if no food was forthcoming or perhaps he would try to steal. The man did neither of these. He merely gathered firewood and built a fire. He put his cooking pot in the stream and hoisted the water-filled pot to his fire. Then while all the villagers peered around doors and out of shuttered windows, the man made a big show of searching for some rounded large stones in the stream. He exclaimed upon finding each one. He rubbed them on his worn tunic and praised their color and delicious odor and then tipped them into his pot. The villagers were quite intrigued by his actions and slowly found reasons to walk past the stranger’s fire. As they would pass he would run a spoon into the water and state that his stone soup needed a little seasoning. If only an old withered carrot or bit of potatoes were available it would be an excellent soup. As the villagers returned to their cottages they would ponder the man’s words and realize they perhaps had something to give. Each in turn began to offer a bit of this and that. He would exclaim his appreciation of each ingredient. The villagers were a competitive, yet caring lot and seeing their neighbors praised encouraged them to give even more. As the day progressed the pot became thick and hard to stir. The stranger soon told the milling crowd the soup was perfect and ladled a generous helping of soup into everyone’s bowl. All ate well that night filled with sustenance and camaraderie. Everyone praised this new recipe called Stone Soup. So how does the stone soup method apply to my work medicine? I don’t know if you have seen me paint at a medical conference but I often think of the stranger in this tale as I paint. When I enter a room, I come burdened with blank canvases and a heavy easel. People watch me set up my station intrigued by an artist painting at a conference. As the conference day begins my canvas is blank then slowly the words of the speakers and attendees fill the air and I begin to paint. Soon the attendees come to the easel and share their thoughts and feelings. My painting fills with imagery just as the stranger’s pot fills with food. It is an amazing process. In a little over two months the Partnership with Patients Summit will be held in Kansas City and we will be using the stone soup model. 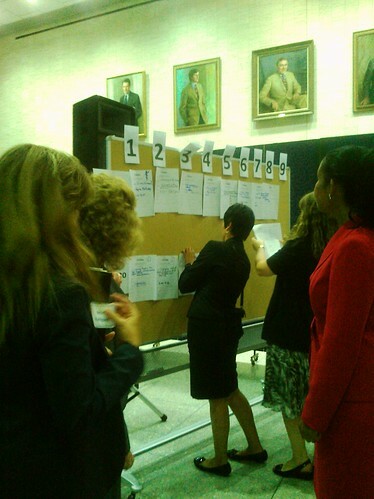 We will have a gathering of the Walking Gallery, a traditional conference day and an unconference day. People who self-define as patient/patient advocates will congregate with partners. The partners could be providers, techies, venders, academics, organizations or health policy wonks. We will gather together to make a conference with everyone throwing something into the pot. There will be a non-profit partner, business partners and regular people creating a crowd-sourced and crowd-funded conference. The idea of a stone soup/crowd-sourced conference has confused a few people. We are once again practicing some creative destruction of the traditional form. This event is not funded by CMS Partnership for Patients, yet we are reporting back to them and focusing on their goals. This event is not organized by a non-profit, though the Society for Participatory Medicine has agreed to create and oversee a travel fund to help patients attend medical conferences such as this one. Cerner is hosting us in their space and acting as a partner, but this is not a Cerner conference. This is a patient summit; and I may be stirring the pot, but I am one of many around the fire. Cerner has graciously offered to provide the “cooking pot” for our conference in the form of their Riverside educational building. This once was a casino many years ago, and is a rather appropriate venue to place a bet. We are betting that we can do much if we just work together. The building has been retrofitted with rooms and technology that supports educational opportunities. You can register for the conference on eventbrite at Partnership With Patients and ticket proceeds will pay for the overhead costs. The overhead cost will include food, transportation, shuttles and conference materials. I asked the Society of Participatory Medicine if they would consider being our non-profit partner whose responsibility would be to create a patient travel scholarship fund. The board agreed that this was a good use of their energy and was in step with their mission. They further added they would like to create such a fund and continue to solicit funds for future conferences. Please send donation checks to The Society for Participatory Medicine PO Box 1183 Newburyport, MA 01950-1183. Please make checks payable to the Society for Participatory Medicine and mark in the memo line "Travel Fund.". Or you can donate online at the donations page, just click on the Travel Fund button. The Society for Participatory Medicine is a 501(c)3 public charity. They will present a panel discussion during the conference explaining the concept of the society and participatory medicine. For the Partnership With Patient Summit they will be offering a limited number of $500 travel grants. The quantity they will be able to offer will be based on donation amounts they receive. Those who wish to receive such grants will write an essay explaining their need. Grantees will be chosen based on review by a committee from the Society. I am asking you today to please donate to this fund. No amount is too small. Everything is appreciated. If you are able to give more that is wonderful. 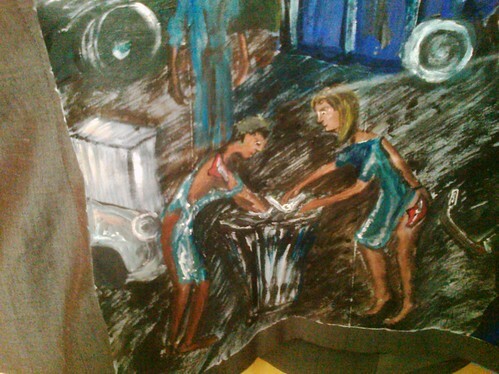 On Friday night September 21st, we will have a Kansas City gathering of The Walking Gallery. This will take place at the Kansas City Marriot. I will be asking for financial support to cover expenses for this venue on Medstartr, a new funding model created by Alex Fair. 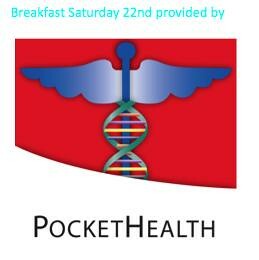 On Saturday the 22nd of Septemeber we will have a conference day that will break into three tracks focusing on HIT, Patient Quality/Safety and Media/Message. These sessions will be taught by many different individuals who are volunteering their time and are leaders in their fields. I will post the full agenda as it forms. Mark Scrimshire and Maumi J.Cannell Chatterton will be hosting a HealthCamp KC unconference on Sunday the 23rd. That is the ingredient they are adding to this stew of advocacy. Simultaneously, patient speakers will be given the opportunity to present 5 minute speeches during a patient speaking session. These speeches will be recorded by Cerner staff and uploaded to youtube. These speeches will be a great asset to beginning speakers who have just joined Speakerlink.org and are building up their online presence. Many other folks have offered their time and skills to help this process. As they send me their offerings I will post them here, but suffice to say we are making a lovely dish. By the way the hashtag for this event on Twitter is #cinderblocks. It rather fits doesn’t it? When making a stone soup, you must begin with stones. When I was a child I went to an elementary school that had few resources. In fifth grade our class was donated a large amount of books. We were very pleased to have them, but we had no bookshelves on which to place them. My teacher was very enterprising though, and she contacted the local lumberyard and requested they donate some two by fours and cinder blocks so we could make shelves. The lumberyard manger said yes with one caveat, we would have to pick up the supplies. That year our fifth grade class had a field trip. We left the school as a class with our strong backs and eager minds. We walked to the lumberyard. Some of us grabbed the two by fours, some of us cinder blocks and some us combined the two to make a carry yoke for two students to heft. We walked those blocks all the way back to school and up three flights of stairs. Then we assembled those shelves and placed the books upon them. We stood back and looked proudly at our work. I cannot believe there was a class anywhere else in the entire nation who cherished their bookshelves as much as we did ours. We loved those shelves because we overcame adversity and made that which we needed. It wasn't pretty, it wasn’t perfect, but it was ours. What if you were alone and suffering? What if it felt like no one understood your pain and the people had turned their backs to you? Then suddenly a window opened and a blue bird tweeted about a new tomorrow. You found there were others like you all over the world. Others like you trying desperately to reach out and become friends. What would you do to make that vision a reality? I know what Afternoon Napper did. She tweeted, she blogged and most recently she began asking for our help on Medstartr. She needs to raise $5,000 dollars by September 7, 2012 to help achieve non-profit status and host a retreat to help individuals who share her rare disease: FMD. “Fibromuscular dysplasia is a rare, noninflammatory, nonatherosclerotic arterial disease that occurs most commonly in women and presents most frequently in the renal artery. FMD may cause arterial stenosis, occlusion, aneurysm, and/or dissection; however, many patients are asymptomatic and may remain undiagnosed or receive diagnosis as an incidental finding, “ explains Afternoon Napper. But who is Afternoon Napper and what is in a name? Some patient advocates have embraced their name as banner representing patient rights. Google Trisha Torrey or my name and post after post will appear focusing on advocacy. You can find us simply on Twitter just using our names. Whereas, some advocates are known by a handle that defines their name. @ePatientDave is the more often used to address Dave deBronkart than his given name and many times I have seen Sherry Reynolds greeted as @cascadia in person. These names may seem whimsical, but within my mind I know Sherry is cascadia and Dave is ePatient Dave. When I painted their stories I knew them as one person with many names. I met Afternoon Napper on twitter. She has a brilliant voice that slices through the often-mundane platitudes that flow through the twitter stream. 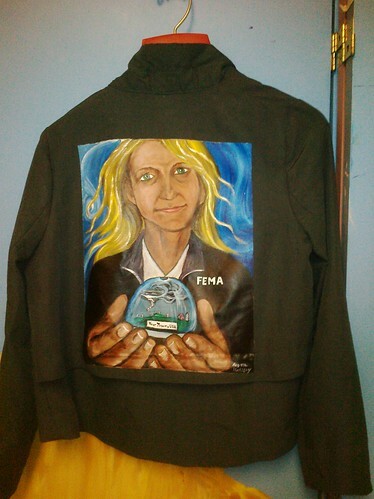 I offered to paint her jacket for the Walking Gallery based her concise and powerful 140 character tweets. I did not know her name. I knew she supported the rather controversial idea that it was okay to sleep when you are tired. Quite a few advocates have spoken out online that a lack of sleep is the only vice still acceptable in health circles. It is not okay to drink to access, eat to access or smoke, but no one bats an eye when one of us admits that we are functioning on less than four hours of sleep. As matter of fact, we are rather proud of the accomplishment. Our society supports such behavior as evidence of a strong work ethic. Anyone who naps must be very sick or is a very small child. God forbid you admit you admit to taking a nap in the middle of the day. I have an adult friend who has commented on her Facebook feed that she planned to take a nap, only to be attacked in her comments field by her friend. 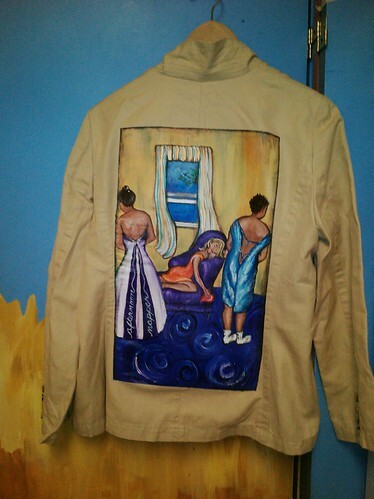 So let me introduce you to Sarah E. Kucharski aka Afternoon Napper and her Walking Gallery jacket: "méridienne." The floor of this painting is a sky’s reminiscent of Van Gogh. In January, Sarah recommended I read: “Lust for Life” a biography of Van Gogh that depicted the extremes of elation and despair that this artist experienced. Sensing that Sarah understood a great deal of the anguish of Van Gogh, his artistic style is foundation upon which the Sarah’s stand. She even wrote to me about the book saying, ”In Irving Stone's biography of Vincent Van Gogh there is a line that reads, "Many times in your life you may think you are failing, but ultimately you will express yourself and that expression will justify your life." It was years ago that I first came across this maxim, and it immediately halted my reading and jolted my heart. There is no other quote that has resonated so deeply within me and continued to do so." The composition of this image is defined by its Dichotomy. 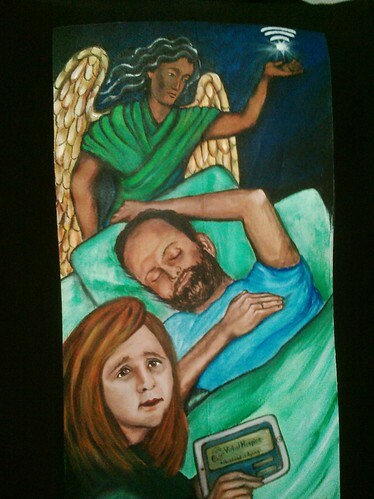 To the right of the painting is Sarah the patient. 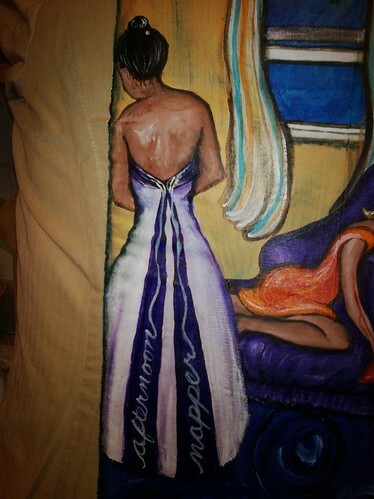 Her back is turned to the viewer. She is an unknown quantity suffering from a rare disease. Sarah has FMD. Sarah has endured surgery after surgery in her short life. She has lost some sensation on her right side, her vision is affected and her body is laced with surgery scars from bypass surgery, kidney removal and a stomach rupture. This patient Sarah leans upon a wall. The Sarah to the left wears a wedding gown. She is married to her disease. She has embraced her life defined by pain and has taken a new name: Afternoon Napper. She is beautiful in this role. Her hair is upswept like many a bride. She is empowered and taking charge of her life and making friends. In the center of this piece is a chaise longue. This couch is the méridienne: the word referrers to the midday nap, the midpoint or midday. Upon this sleeping couch a woman lounges. She is the FMD girl: the avatar image of Afternoon Napper and she holds the heart from FMD Chat in her small hand. Behind her a window is open and a twitter bird twills a greeting. “Join us,” he says. We have often joked with @afternoonnapper on Twitter. What is her real name? What does she look like? I threatened to out her in March for the Sarah that she is. This morning I awoke to a wonderful post from Afternoon Napper on Facebook and it was saying “This is me.” The article was entitled “NC Woman’sRare Disease Prompts an Uncommon Response.” The article focused on Sarah and her new project on Medstartr. I am happy to see Afternoon Napper/Sarah become one amazing person. Today I proudly logged onto Medstartr and supported her cause. I would ask all of you to consider doing the same. If everyone who followed Sarah were to give $5 dollars each, Sarah would reach her goal. That is such as small price to pay for all she has given us. There are a few members of the press who are also members of the Walking Gallery. Over the past year I have asked many to join us in this movement, but there are those who feel they cannot. Some seem afraid to share the power of their story. Some feel constrained by the rules of their profession. The latter reason is used by many in the press to explain their inability to join us. I always respond, “It is your story.” Being a member of an unbiased press does not deny you the right to speak about your personal life. I am glad Don Fluckinger decided to join the gallery and tell us his story. 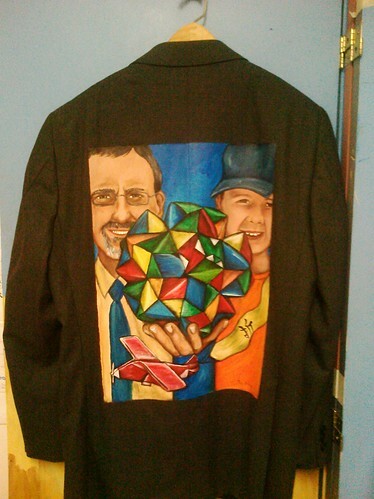 Sadly, on June 4th when we gathered in DC, I did not have his jacket painting finished. He spent that night wearing a jacket I quickly emblazoned with the downloading spinner and the written word “downloading.” Quite a few in the crowd chuckled at Don’s endlessly downloading jacket. Don is a reporter with SearchHealthIT. He writes articles and interviews people who work within the world of health policy and HIT (Health Information Technology.) Much of the content that Don must parse is a heady brew of legislation mixed with vender confusion. Don creates clear and concise articles for CIO’s and CMIO’s to understand this labyrinthine tangle of law and commerce. I can attest that his writing is nuanced yet clear and even a data access artist can enjoy the content. Don reminds me of a baker, folding one dense ingredient into other lighter elements until a consistent tone is reached. But Don is more than his writing; he is a father to a wonderful boy. Don’s son Patrick is what some would term twice exceptional; he is very smart but has some processing issues. Up until quite recently Aspergers Syndrome was the clinical term used to define him. This term will soon be folded into the broader autism spectrum disorders heading in the new edition of the DSM (Diagnostic and Statistical Manual of Mental Disorders). Many in the Aspergers community are quite upset by this change. They had been labeled by others, yet had come to embrace their difference and their title, often calling themselves aspies. Patrick loves to fold origami paper into intricate designs. He has even created a little origami garden for his father’s desk. 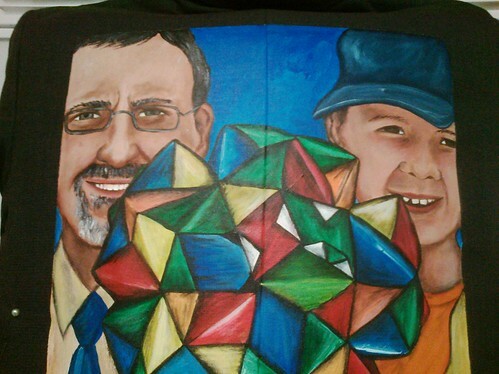 So within this painting Don holds an amazingly complex origami shape known as a truncated icosahedron. Patrick cannot fold this yet, but he is already trying. If you look at the center of this mass of folded paper you will see the letters DSM. Here is an image of autism spectrum disorders defined in paper; it hard to see which paper folds press in and which out. Only one thing is clear about this bright shape as it folds in upon itself: it is labeled DSM. 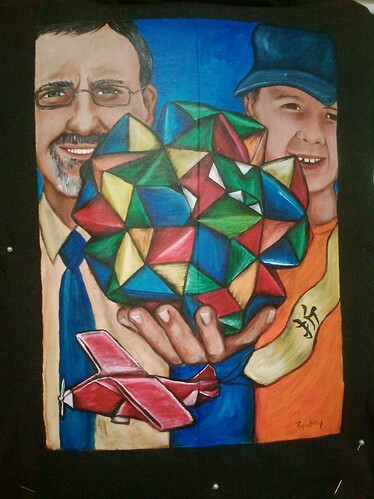 Below father and son an origami paper airplane flies, for Don himself has a title within the DSM. Don, the brilliant reporter that I have spoken with in cities throughout our great nation, is afraid to fly. Every time he boards plane he fights against himself and his own anxiety. I have always appreciated my conversations with Don, but now I doubly cherish them knowing the stress he experiences every time he flies. 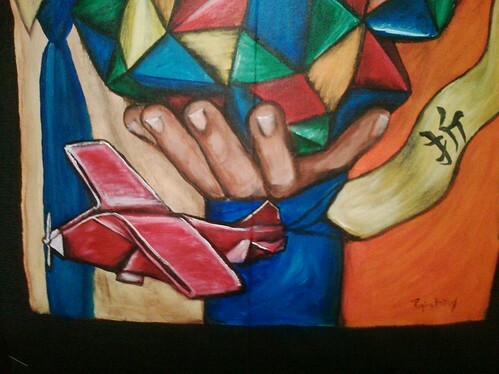 A message flutters behind the origami plane. Upon the billowing streamer is one Japanese character: “to fold.” Folding is such a powerful word in our world of HIT. Does it refer to that amazing crowd sourced protein folding project: Foldit? Or perhaps folding refers to the demise of many start-ups Don and I have seen in the last three years at health tech events. Does folding represent the future of paper? Are we heading into a world where paper is prized more for its ability to hold a three dimensional shape, rather than a thought? Or is folding something one little boy does really well? Perhaps we do not always need words to send messages on paper. Sometimes the shape of itself can speak louder than any spoken word or bold font. Sometimes the folding itself can say I love you. You see them in airport stores and kitschy roadside attractions. They are the standby of the hurried traveler: the simple snow dome. Snow domes always amazed me as a child. I loved the magnified wonder of the little plastic diorama scenes. Some of the domes would replace the proverbial snow with glitter instead. Glitter swirling in the air of these magical scenes seemed perfect. The dome offered more. It offered the trespassing tourist a glimpse of how a people saw themselves. The town may be small, the roadside attraction may be kitsch, but to those that lived here this was home and it was beautiful. As a child, I could not resist the temptation to shake the globe and watch the snow or glitter swirl in tornado’s fury of motion. Yet nothing was destroyed within the magnified dome. All would settle peacefully, and I would leave the dome upon the store shelf. Do you know Angela Lynn? If you read her LinkedIn profile you might think you just read the resume of a saint or a superhero. She was a program director for women and children in a domestic violence shelter, she was a coach, a special needs teacher, a pilot, a volunteer liaison for Red Cross disasters and her current job is working for FEMA. 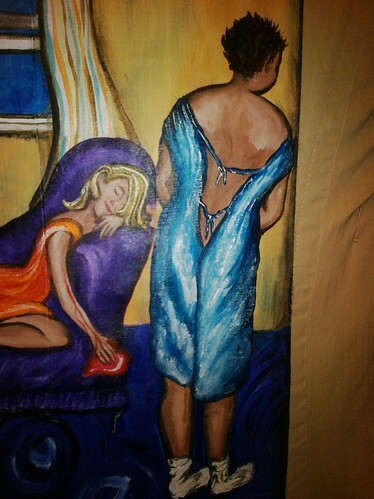 In this painting Angela stares at the viewer. Her face is ageless, beautiful yet-time worn. She has seen so much. Angels gets the call and travels anywhere in the United States after a disaster. She has dealt with the immediate aftermath of floods, tornadoes, hurricanes, fires, pandemics and earthquakes. She has no idea what the place will look like when she arrives, but she knows it will not be the pristine image seen inside a snow dome. She will see faces twisted in sorrow and grief, people beaten down by stress. Some of the people she encounters will be angry and explosive; some will be quiet with a silence inspired by shock. Some people will pitch in, constantly helping as volunteers. The first days and weeks after a disaster are heady, the press descends and many of those who toil are working fueled by pure adrenalin. But then the weeks pass, and the excitement turns into a depressive state as people realize things will never be the same. The press leaves, yet homes and dreams are still shattered. Angela watches this whole cycle of disaster again and again. She holds the hands of the elderly and the new mothers. She goes through forms and explains the system while trying desperately to provide aid. Sometimes she finds there is no FEMA help available, but she tries to unite those in need with services that can help them. And when the time comes to leave, Angela must fly away from a town still reeling. She is the visitor who only gets to see the dreadful after. She hopes that those she left will see a better tomorrow. She hopes the picturesque town inside the dome will live again. She carries back all she sees to her home and family. She does not take for granted a warm bed, safe food and funds within her bank account. She does not take for granted the friends she has and life she lives. She knows too well at anytime this life could shatter. 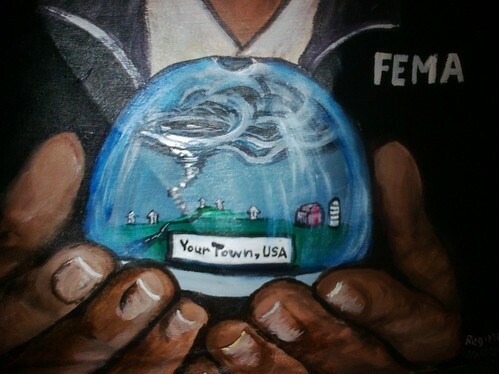 She knows in a moment the dome could crack and shatter in your town, USA. Then the phone will ring and Angela will grab her bags. She will do her best to help those who lost all they had. She will look into eyes drained of all their sparkle just as assuredly as a little broken dome. I took the classes with my husband. I leaned back into his warm torso. I placed my hands upon my taunt belly and took a deep breath. I felt the breath deep within, centering me, supporting me. Then I let it go. I was preparing for the time to come: birth, new life and the pain of it all. I knew I could make through. The instructor said concentrate on the breathing. My body had changed so much in these many weeks. My torso swelled, I was retaining water and could no longer see my ankle bones. Walking was hard, breathing was hard, but through it all he stood beside me. Soon the baby would come and I would get my body back. The Lamaze class ended and the gaggle of pregnant women and the cluster of husbands would mutter in an excited anticipatory way. We were walking this path together and everyone could relate. I read pamphlets and books that would cover every detail of this exciting adventure. I was familiar with terms like contractions, dilated and active labor. If I tired of reading, I could question our Lamaze instructor or my OBGYN. I could ask my neighbors, friends and relatives about their birth experience. I didn’t even have to ask, folks constantly would tell me their stories unsolicited. Ten years would pass us by. Ten years of bills, work, scraped knees and sweet smiles. Ten years of moments not appreciated until they have passed us by. Through ten years of joy and sorrow, I never forgot the most important lesson: Concentrate on breathing. Close your eyes and take a deep breath and let it out. So many people want to talk about how we are born, but very few want to talk about how we die. Colleen Young is a community manager of Virtual Hospice of Canada. I met her on Twitter and I think of her as a type of Lamaze instructor for death. I see her frequent caring comments on end of life and cancer care. I know she is kind and informed. She is far away, but she can offer so much support online. 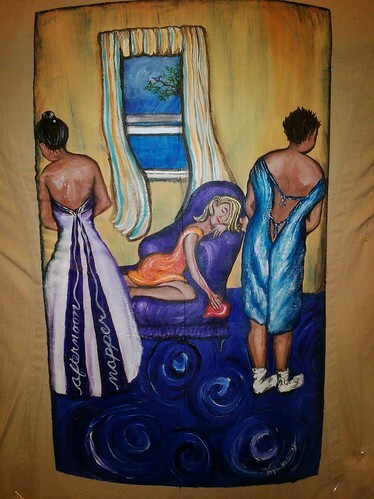 When she said she would like to join the Walking Gallery I knew what I wanted to paint for her. There are no hospice cards. The mailbox is often empty, both online and in life. This is that quiet before the storm. The lonely solitude before the mailbox fills again with sympathy notes. Into this utter darkness a cursor blinks. It is Colleen and others like her answering end of life discussion group questions both metaphysic and mundane. Here is this space we can learn about active death and its symptoms just as easily as I once learned of active labor. 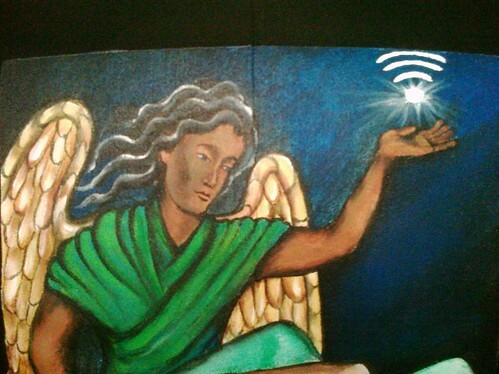 Within this painting is the Archangel WiFi. The angel stands above my husband and me, for through this signal we can find someone to talk with us, someone who can explain this scary journey. In my hands I hold the I-pad I needed at that time picking up the signal not available when my husband was ill.
Fred came home to die after three weeks in inpatient hospice. I sat beside him as his hands fluttered and plucked at his gown and blanket. His body had changed so much in these many weeks. His torso swelled, he was retaining water. I could no longer see his ankle bones. Sitting up was hard, breathing was hard, but through it all he smiled at me. Soon it would be over. His hands were placed upon his taunt belly. He took a deep rattling breath. I felt his breath deep within, centering me, supporting me. Then I let him go. He was preparing for the time to come: death, new life and the pain of it all. I knew he could make through.